Will there be a European NFL franchise anytime soon? After experiencing the first of the three NFL international series games at Wembley stadium last Sunday between the Miami Dolphins and the Oakland Raiders, in the aftermath I found myself wondering as a fan, will there be a fully fledged international franchise in the NFL anytime soon? The idea for the first NFL franchise to come from outside the United States of America has been slowly building momentum since the first international series game at Wembley in 2007. That one game has now turned into three regular season games with the promise of more to come in the ensuing years. This growing momentum could well lead to a permanent NFL franchise in the next 10 years, but could it work logistically? Many at first glance would simply dismiss this idea with a quick “no”, citing the vast distance that would be between every other NFL franchise in America and a European franchise. The move would also meet with a widespread resistance from within the NFL, as I’m sure a large majority of the current 32 NFL franchises would not be willing to travel across to Europe to play, despite the obvious commercial benefits of the NFL branching out into Europe. When actually giving this idea some thought some other considerations have to come into play also. Firstly history, whilst this may sound a bit strange to hear at first we must first look at the success and ultimate failure of NFL Europe when discussing a permanent franchise in Europe. Whilst NFL Europe contained some good players during it’s tenure from 1991 and 2007. The league was supported by the NFL with the teams using the European teams as a development league for young players not yet ready for the NFL. Alongside these players were those in the later stages of their career or free agents not picked up by the NFL after college. The attendances were steady if not spectacular with an average of just over 20 000 across the league for their final season in 2007. Whilst the attendance of 83 459 for last Sunday’s game is very impressive and shows the support the NFL has in Europe, yet could this be realistically sustained across a 16 week season? Another factor to consider is the logistics with starting an NFL franchise. This is something that is difficult enough to start in America, let alone Europe with the last NFL franchise being the Houston Texans in 2002. The infrastructure needed to start the franchise would take several years to put in place, with obvious factors such as training facilities alongside finding a permanent stadium would all be things to organise. Aside from the infrastructure the actual roster itself would pose problems as it would likely be much harder to attract top line players to join a team so removed from their own culture, despite the growing international flavour of the NFL. With all these factors considered for me the most logical step is to carry on with what the NFL is planning at the moment, to slowly increase the level of support in Europe with a gradual increase in the amount of games hosted in Europe to effectively gain the required support needed before any thoughts of a permanent franchise can be considered. For now the NFL has the right recipe for success with a crucial market such as Europe, it’s now up to them to follow through with it. First of all, I want to make it clear that I do not claim to be an expert on this subject or indeed have an abundance of expert knowledge on this subject. This is simply written by a regular college sports fans who doesn’t understand how it’s fair for Universities and head coaches to collect millions of dollars from college athletics, yet the athletes themselves are forced to live a hand-to mouth existence until they complete their degree or turn professional in their respective sports. This is a topical subject at the present moment as a judge ruled in favour of student athletes only a few days ago that they can sell the rights to their names and images, with the money being given to them once they’ve completed College. Although it’s unlikely to generate mega sums for student athletes the opportunity to be given $20 000 dollars after 4 years of College is a lot better than current athletes receive. Lead plaintiff in the case Ed O’Bannon, former UCLA basketball star, stated he joined the lawsuit against the NCAA after he saw his image used in a NCAA licenced video game that he was not paid for. The role of “improper benefits” and the rules sanctioned by the NCAA are constantly being challenged or broken by student athletes. 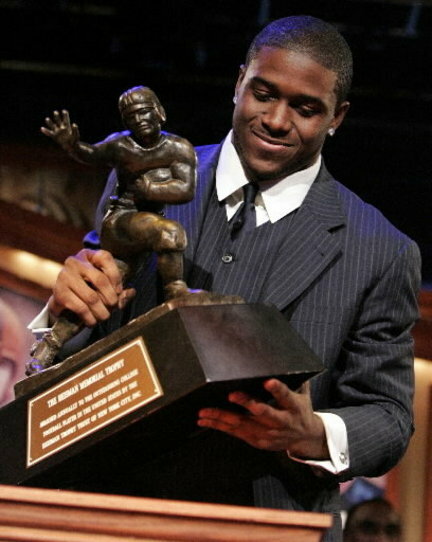 A Notable example is include Reggie Bush being forced to hand back his 2005 Heisman Trophy, awarded to College football’s best player that year, for receiving “improper benefits” whilst at USC between 2003-2005. For many student athletes the problem occurs when Universities “boosters” get involved, “boosters” are linked to Universities and help with their funding. The problems however is that whilst many student athletes become nationwide stars they are not allowed to receive any benefits from their status. Whilst the NCAA stance that student athletes are students first and University should only be about furthering their education is a very noble idea in principle, it’s hard to see past how NCAA athletics have simply become farm systems for professional sports such as the NFL,NBA or MLB. It does seem absurd in 2014 that whilst the Universities receive tens of millions of dollars a year from NCAA athletics, and coaches receive millions of dollars a year that the actual players themselves cannot even have someone pay for their breakfast as this would be deemed a NCAA violation under the “Improper benefits” policy. Whilst I am not suggesting that College players should start being paid an astronomical amount, I simply feel they should be fairly compensated for their efforts with a modest salary that will allow them to have a slightly better existence whilst at College. For many players, they commit NCAA infractions for simple things such as having a meal paid for them or being given money for clothes. This is something most regular teenage students do yet when the NCAA are involved it’s deemed students are using their status for benefit, therefore forfeiting their amateur status. In the last few years it has become common for College athletes to declare for the NFL or NBA draft increasingly earlier than in the past. Whilst many who follow College sports are trying to work out how to keep students in College for longer so they can complete their degrees, it seems simply that these students jump at the first opportunity they get to go professional and earn enough money to take care of themselves and their family. For College football players they have to wait 3 years whilst for the NBA players can declare at any time during their College career. The final comment is that throughout the years their have been plenty of incredible College players who have been unable to convert their considerable talent into the money they deserve for an abundance of reasons such as injury or NCAA violations, and this is exactly why College athletes should receive a modest salary in a billion dollar industry as it seems highly unfair in my opinion that players such as Marcus Dupree, Melvin Bratton and Maurice Clarett should be have their dreams of reaching the NFL taken away and yet not be compensated for their previous efforts of playing in front of 60- 80 000 fans. If the University and Coaches should receive mega bucks benefits from College athletics, shouldn’t the players receive a small portion of that too.